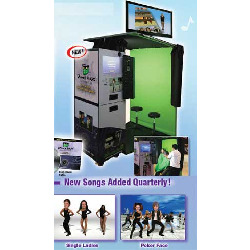 Rent this video recording booth for a fun event! More than an Photo Booth, it’s a green screen Video Booth! A new, innovative, funny and mesmerizing form of party entertainment, Dance Heads has captivated audiences and participants of all ages. The hilarity begins when participants’ heads are superimposed on the bodies of professional dancers. The participants can sing-a-long or just laugh and bob their heads to some great pop hits such as “I Feel Good”, “Super Freak” , “I will Survive” and many more tunes from which they can participate alone, as a duet, or as a trio, but don’t confuse Dance Heads with lip-syncing or karaoke! The outrageous effect is complete with fully animated backgrounds. With Dance Heads, you can create an event that guests will never forget. It is great for both retail and corporate events.